Although the practice of pre-weaving the mains before tensioning the first main is not new, I have received mixed comments to this regard. I wanted to continue dialog here as to the benefits and perhaps shortfalls. DEFINITION: To be clear on this, I define 'pre-weaving' as the process of installing all the main strings in the racket frame before tensioning any strings. Again this only applies for the 'main' strings. The only frames that I will not do this with are the Prince 'O' series frames because it just becomes too messy. Pre-weaving can be done with a two piece or one piece installation, generally I will use this practice with a one-piece. I can generally install a two-piece quickly and don't always find it necessary to pre-weave due to the length of the string. Some time back I posted some information about how 'pre-weaving' the main strings saves time/ efficiency in the overall racket stringing process. I continue to find this the case although not all racket stringers agree, which is alright with me. Here is why I feel it saves time and why in my opinion it is a best practice to do so. I welcome and would appreciate any comments on this issue and will be happy to post your comments. I understand stringing techniques can become a personal issue with stringers, we all have 'our' way of doing things and if for no other reason but because 'it works' for us. Right? It took me about ten years or so to finally figure out that this does save time and reduces repetitive motions. 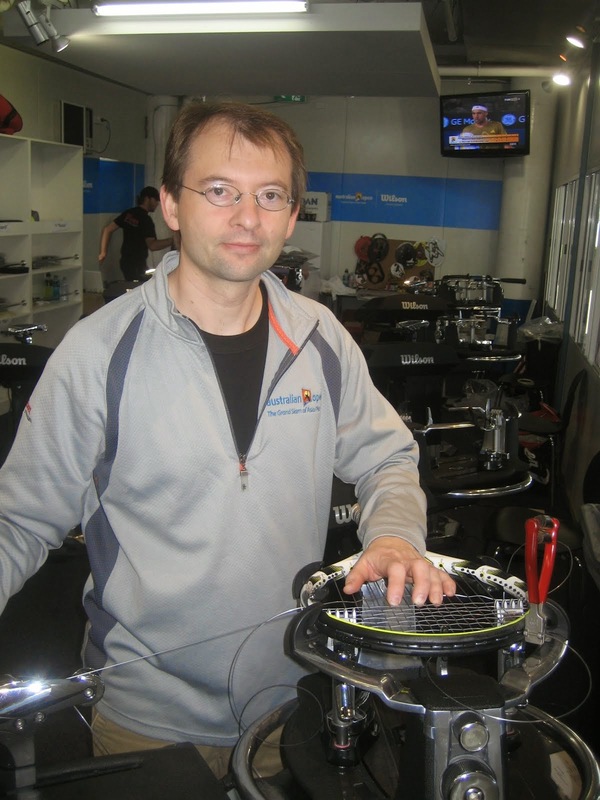 I learned early on how to string rackets by professional stringers and a few guys who really knew their stuff. It wasn't until I strung at my first professional tennis tournament that I realized I needed to change some of my habits if I was to become a better stringer. I want to share that here so I can help you become a better stringer as well. One of those 'habits' was the weaving technique I was using. Generally I would install one string than pull the tension and clamp. Then I would look for the string end and run the whole length of the string in my fingers till the end was in my hand and then would pull the string through the hole again, pull the tension, clamp and repeat. The process of dropping the string end each time tends to create more work because you need to continue the repetitive motion each time to find the end. I have seen some stringers who will take the end and put it in another hole to kind of 'hold it' in place so they don't need to find it each time, this still seems to create more work each time. So by pre-weaving you reduce the amount of times you need to do the above steps and in the process you also can keep the short side from becoming to 'short' or 'long'. At first it will seem like you have this tangled mess of strings in the racket and you might become confused as to what to do next. I hope to have a video shortly on the technique and how to do this properly. Generally I save about 4-5 minutes per frame when I pre-weave. Almost all the professional stringers that I have worked with at various tournaments including the Grand Slam events pre-weave the main strings. Let me say this again - Almost all professional stringers that I have worked with 'pre-weave' the main strings. As you first learn this practice it will take you longer to string because it can become easy to get confused as to what string to clamp and what string to pull, etc. Once you practice frame after frame it will become automatic and you won't even think twice. I hoped this helps, be sure to sign up for my newsletter and I will keep you in the know. 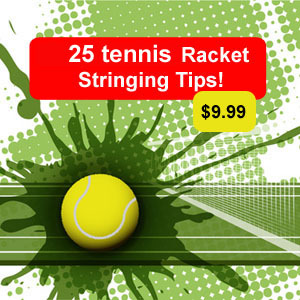 Nice and Very useful tips for Tennis Rackets Stringing.. I know the concept and importance of "pre-wave" , but it seems that it is the most important during Stringing.